There may be no morsel of Argentine cuisine better known than the empanada. A simple treat of seasoned meat, cheese, and/or vegetables cooked inside a pastry crust, empanada ranks among the world's best-loved street foods. In fact, the stuffed turnovers have become popular and easy to find in many countries, and most major cities — including our own. 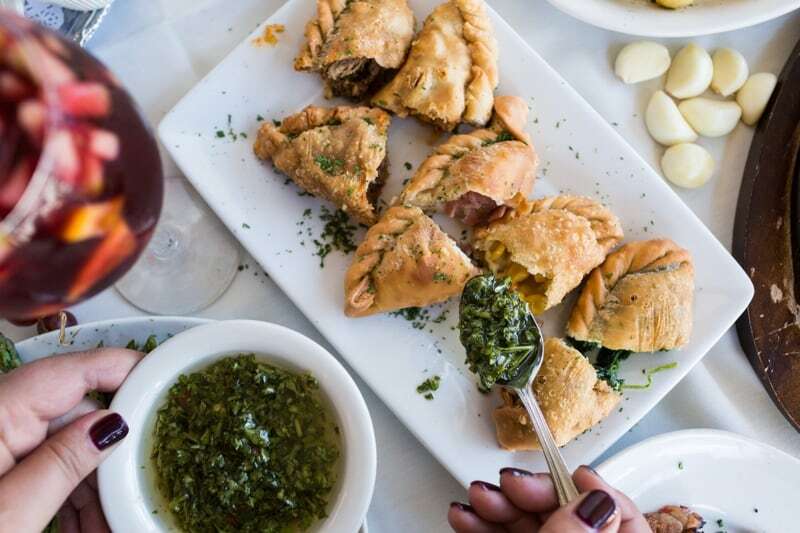 Of course, to try the best Argentinian-style empanadas in San Diego, we recommend paying a visit to Puerto La Boca in Little Italy. Our terrific fried empanadas prove a great menu option whether it's time for lunch, dinner, or happy hour. True to custom, we offer many different empanadas to give customers a choice of empanada filling. Historically, all kinds of fillings — or rellenos — have been used to make empanadas, including sweet, dessert fillings including chocolate and fruit. However, most common are classic savory versions, such as beef empanadas or chicken empanadas. At Puerto La Boca, we prefer to keep it simple, with a stewed meat or vegetable, and maybe melted cheese. The traditionally seasoned beef empanadas and chicken empanadas may be our most popular, and our universally beloved ham and cheese empanadas taste great for lunch, or any time of day. Vegetarians should not feel left out though. Our spinach and cheese empanada is a favorite, even among our meat-eating customers, and the corn and cheese option holds the most appeal to those with a sweet tooth. You might just want to try one of each and call it lunch. Depending on the restaurant, empanadas may be fried or baked. At Puerto La Boca in Little Italy, we prefer fried empanadas, as they turn out more like small pies, with less residual grease.. The crust of our fried empanadas is toasted golden brown, while the insides are generously stuffed with empanada filling. Of course, just like you can't talk about Argentinian food without talking about empanadas, you can't talk about empanadas without talking about chimichurri sauce. The green, herbal sauce at Puerto La Boca has won over many a fan over the years, to the point we had to start selling jars of it for people to take home. Chimichurri goes great with the grilled beef that populates our menu, but it also goes great as a dip for any one of our fried empanadas. We serve empanadas at lunch, at dinner, and every day during happy hour — 4:30pm-7:30pm — when they're 30-percent off! You can also call in an order to take home, or order a large quality for a special gathering or event. If you love empanadas, our are a must-try. Because for the best Argentinian-style empanadas in San Diego, the place to go is Little Italy, and Puerto La Boca. Visit us or give us a call at (619) 234-4900 if you have any questions.